My name is Samuel Pearce, and I teach English to seventy-five amazing eighth graders at a public school in Bushwick. Last year, 124 people donated a total of $5,255 to provide each of my students with the chance to request and read three books, building a classroom library. Thanks to their generosity, my avid readers always had books that interested and challenged them. My non-readers finished their first-ever, second, and third books because they were reading about what they cared about, from mechanics to basketball to Questlove to Twilight. The remaining funds purchased class sets of the novels that we read together so that students could read them at home and complete homework that reinforces classwork. You can see photographs and the book list from last year’s project on instagram @therightbook or at www.instagram.com/therightbook. Incidentally, my students who received these books earned the highest English Language Arts State Test scores in the school. To all of the original donors, our gratitude is deep and permanent. As you saw from their thank you notes, my students understand how lucky they are. I want to give the same opportunity to my current students. As 7th graders, they borrowed our books and asked if they would be able to request books and build the library as eighth graders. I have challenged them, as a class, to read 1,000 books, not including those that we read as a class, before graduation. Each time they check out a book, they fill out a “book card,” with their name, title, author, date borrowed, and an ambitious goal for when they will finish it. When they finish, I sign, and they post it on our wall. So far, we have read 364. My old students graduated knowing that they have "lifetime membership" to our library, and many have come back to check out books that they need for high school, or simply want to read. This year's sixth and seventh graders, whom I teach in afterschool, also borrow from our library. 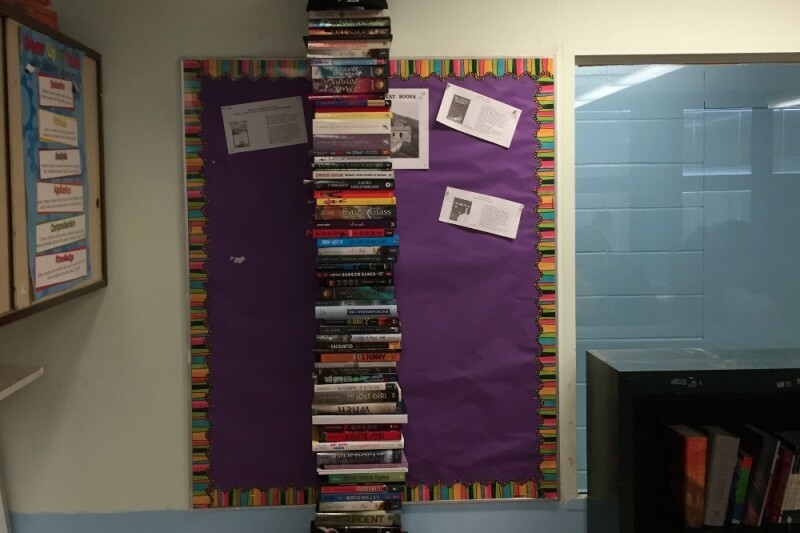 Last year, $4,802, the proceeds of the fundraiser after fees, funded 68-copy class sets of Of Mice and Men and Fahrenheit 451, a 28-copy classroom set of The Absolutely True Diary of A Part Time in Indian, four bookshelves, and three books requested by each student. Each graduate took one book to keep. This year, to bring my students book immediately and proceed with the curriculum, instead of waiting for funds, I am buying books up front, with my savings. I have published all purchases below this message, and donors may choose to "sponsor" a particular book or set of books. Our goal this year is to raise $5,000, to buy the books we need. All donors will receive a thank you note from one of my students. If you would like yours to be handwritten, kindly message me your address through this website. Donations of books are also gratefully accepted. For mailing instructions or questions, please message me through this website, and I will reply as soon as possible. Complete book list for 2015-2016. Our goal this year is to raise $5,000 ($4,605 after fees) to fund the following books. An asterisk* indicates that those books have already been purchased. -which leaves $755.54 for one last book requested by each student.